Tuesday night, AICUO celebrated the winners of the AICUO Award for Excellence in the Visual Arts with a reception and exhibit at Ohio Dominican University. Oberlin College senior Brannon Rockwell-Charland took home the Grand Award as well as the prize of $2,500! One of her works will also be purchased by AICUO to be hung for a year in the governor's office before returning to AICUO's permanent collection. 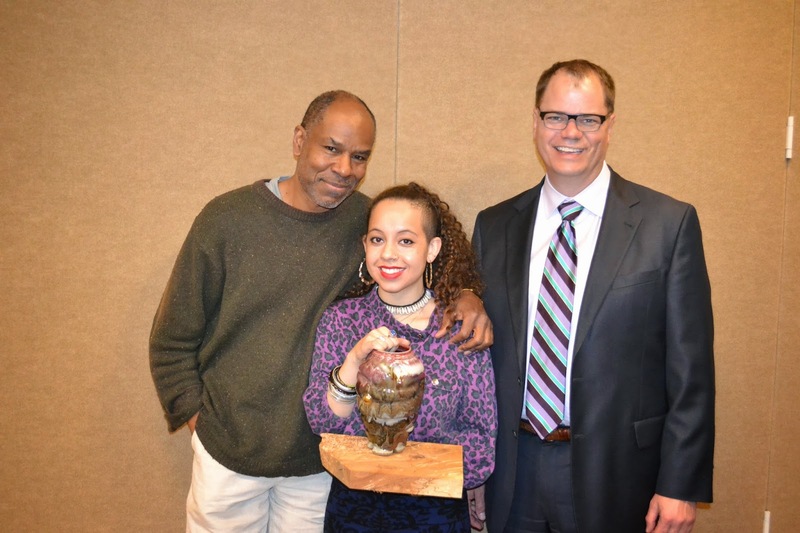 Denison University artist Hunter Hughes was awarded the People's Choice Award. He received the most votes in the public on-line voting portion of the competition. Brannon Rockwell-Charland (Oberlin College): Sharon Weiss Gallery, 20 E. Lincoln St.
Hunter Hughes (Denison University): Marcia Evans Gallery, 8 E. Lincoln St.
Kayla Malone (University of Rio Grande): Sherrie Gallerie, 694 N. High St.
Brittany Lang (Ohio Northern University): pm gallery, 726 N. High St.
Chloe McEldowney (University of Dayton): Grid Furnishings, 944 N. High St.
Jesse Helmers (University of Dayton): Grid Furnishings, 944 N. High St.